Two No.72a bright red cords, one is 1.5 meters long and the other is 0.8 meters long. Put the two cords together to tie an overhand knot from the middle of two cords.Click here to see the overhand knot tutorial. Tighten and fold the cords in half and tie the four red cords together with an overhand knot. You will make a loop easily. Click here to see the overhand knot tutorial. Tighten the knot. Put 2 short cords between 2 long cords as the holding cord. Start braiding bracelet by using the flat knot.Click here to see the flat knot tutorial. Thread a 6mm agate bead in the middle of cord after you braided it about 6 cm long. Continue braiding bracelet by using the flat knot. Click here to see the flat knot tutorial. Thread a 6mm black agate bead again on the middle of cord after you braided it about 1 cm long. Repeat the same step 6. Repeat the same step 7. Repeat the same step 6. 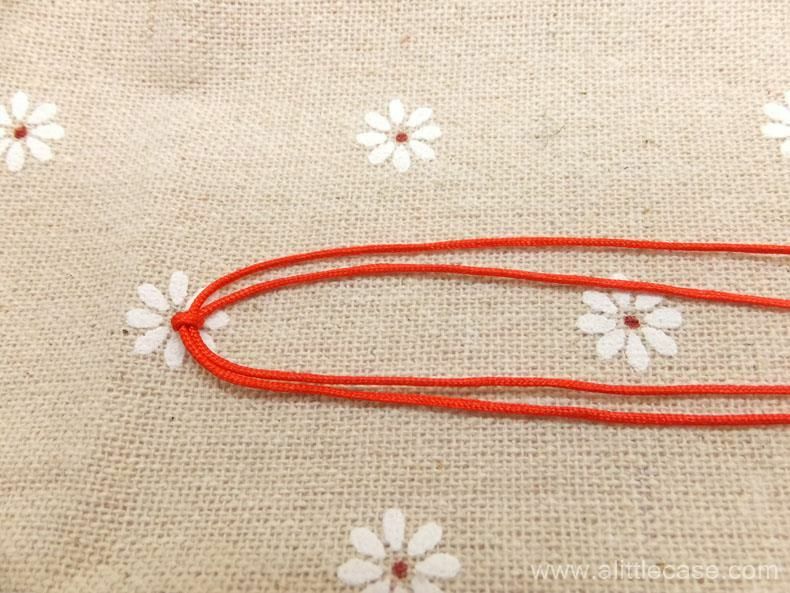 Continue braiding bracelet by using the flat knot. Click here to see the flat knot tutorial. Thread the last 6mm black agate bead in the middle of cord after you have braided your bracelet about 14.5 cm long. Trim the excess working cords. Then burn the ends. Tie an overhand knot at the end of cord. Trim the excess cords and burn the ends. Click here to see how to tie an overhand knot instruction. Click here to see the flat knot tutorial. http://www.alittlecase.com/item/details/29 Thanks! I found it a BIT confusing.....but loved it! Please, the Link for flat knot is not there? Beautiful, I wish to make it. Please visit my blog website! http://www.alittlecase.com/item/details/29 Thanks!